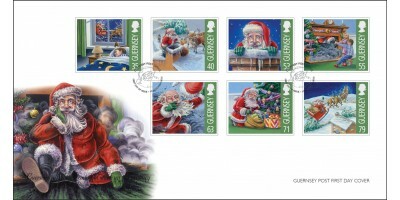 Stamp Descriptions 35p - Santa gliding past the window40p- Santa lands on the roof53p - Santa is stuck in the chimney55p - Children pulling Santa out63p - Santa sneezing71p - Santa leaves presents79p..
Music has long been a feature of the Christmas season and its celebrations. Whilst the earliest chants, litanies, and hymns were Latin works intended for use during the church liturgy, rather than popular songs, over time the words and music has evolved. Today's musical Christmas celebrations comprise a variety of genres from traditional carols, emotive melodic arrangements, to fun 'sing-a-long' favourites. To celebrate the 2013 festive season we have chosen to focus on the entertaining song 'When Santa got stuck up the chimney.' 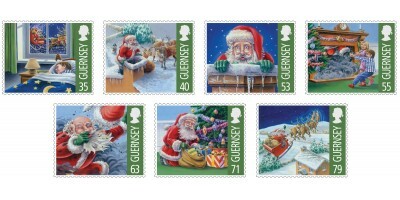 The charming images on the stamps, created by talented artist Nick Watton, imaginatively bring the lyrics to life. Not much is known about the song's history, originally a folk song the popular version we're familiar with today has been performed by many artists over the years including Jimmy Grafton.